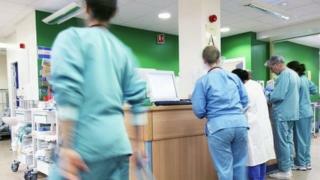 Scotland’s health “is not improving” as the NHS faces “significant challenges”, Audit Scotland has warned. The watchdog’s annual report lists concerns over missed targets, longer waiting times, “stalled” improvements and growing pressure on budgets. Scottish Labour has renewed its calls for Health Secretary Shona Robison to quit in light of the report. Ms Robison insisted that “significant” improvements have been made, while stressing that there is “no quick fix”. The report was the focus of much of Thursday’s weekly session of questions to the first minister at Holyrood, with Nicola Sturgeon acknowledging “big challenges” for the health service. But she insisted that “against many measures” the Scottish NHS was performing better than elsewhere in the UK. The Scottish government published its “blueprint” for the future of the NHS in December 2016, aiming to treat people closer to home rather than in hospital. Audit Scotland’s latest annual report stated that there was a “general consensus in Scotland that healthcare cannot continue to be provided in the same way”, but concluded that “more progress needs to be made if transformational change is to happen”. It found that existing challenges like “increasing costs, growing demand, and the continuing pressures on public finances” had continued to “intensify” in 2016-17. The public spending watchdog said there had been progress, but warned that “fundamental” areas still needed to be addressed. At £12.9bn, health funding now accounts for 43% of the overall Scottish government budget. Despite an increase in the NHS budget, rising operating costs have meant health boards had to make “unprecedented” savings of almost £390m in order to break even. And while the budget for 2017-18 saw an increase in cash terms, there was actually a decrease of 0.1% in real terms from the prior year. The Audit Scotland report concluded that simply adding more funding was “no longer sufficient” to achieve the “step change” needed across the system. It said that budgeting on a year-by-year basis is “hindering development of longer-term plans for moving more care out of hospital”, and said a clearer long-term financial framework was “critical”. However, the report did state that there is a “positive basis on which to build” for Scotland’s NHS. It noted that Scotland has had “a consistent overall policy direction in health for many years” and there was “broad consensus” on goals. It said that staff “remain committed to providing high-quality care”, while levels of overall patient satisfaction “continue to be high” and the Scottish public “hold the NHS in high regard”. And it noted that early signs are that changes in the way services are planned and delivered are “beginning to have a positive impact”, such as a reduction in delayed discharges. Auditor General Caroline Gardner said there was “widespread agreement” that healthcare “must be delivered differently if it is to withstand growing pressure on services”. She said: “There is no simple solution, but these fundamental areas must be addressed if reform is to deliver the scale of transformation that’s needed across the NHS. At Holyrood, Scottish Conservative leader Ruth Davidson accused First Minister Nicola Sturgeon of trying to sweep concerns about the health services under the carpet. She said the Scottish government was “struggling to do the basics”, adding: “The SNP set their own targets to make things better but they’ve improved in only one in the last five years. Labour’s interim leader Alex Rowley said problems with the health service were “spiralling out of control”. He acknowledged that reform of the NHS was not easy, but said the government was “not doing enough and is not moving fast enough”. In response, Ms Sturgeon said there were “big challenges” for the NHS – but said these existed “in every health service across the developed world”. Labour also said the report showed that it was “time for Shona Robison to go as health secretary”. Ms Robison insisted there were some “encouraging” elements to the report, highlighting high patient satisfaction and “innovative work being done”. She said there had been “significant improvements in Scotland’s health system” under the SNP, “driven by our clear vision for the future for the NHS”, citing increased staff levels and “record investment”. The Dundee MSP said: “We have long been realistic about the challenges for the NHS and the need for change. “Ultimately, our work across government will ensure the people of Scotland can continue to look forward to a healthier future,” she said.